Škoda has developed a number of study models, the brand has more than 100 years of history, which have never been produced, and some information about these models is still available today, and many prototypes are not even in the Škoda Museum. 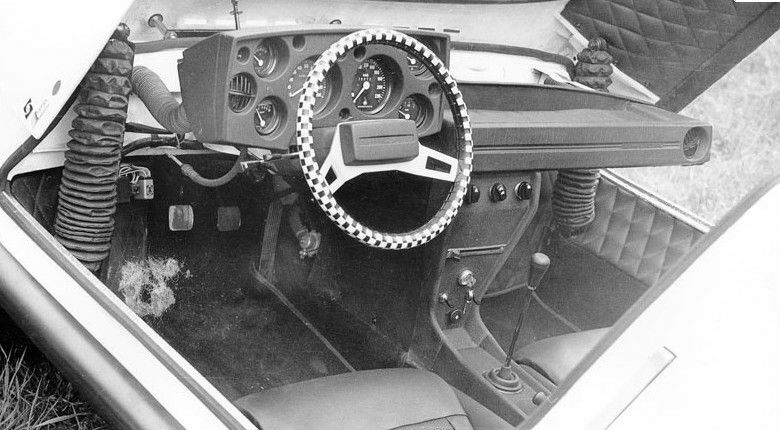 Škoda in 1971 in the spring presented a new developed AZNP Kvasiny two-seater sports car prototype, which was a mid-engine model, and its name is Škoda Super Sport. The sports car returned 10 years later, which was originally a white sports car with hidden headlights, but after 10 years, the Škoda sports car returned with black paint like a movie star, which was named „Ferat“ in the Czechoslovak horror film - In addition to black painting, Skoda got traditional headlights. The project car‘s name was Š 724, and was born in 1969, which was just one idea for a small series sports car, and the car was primarily intended for export to western European countries. Thanks to the collaboration of AZNP Mladá Boleslav, AZNP Kvasiny, VVZ Jawa Praha, Vertex Králové and Autopal Novy Jičin, the new hot sports car prototype was created, which was a development study. 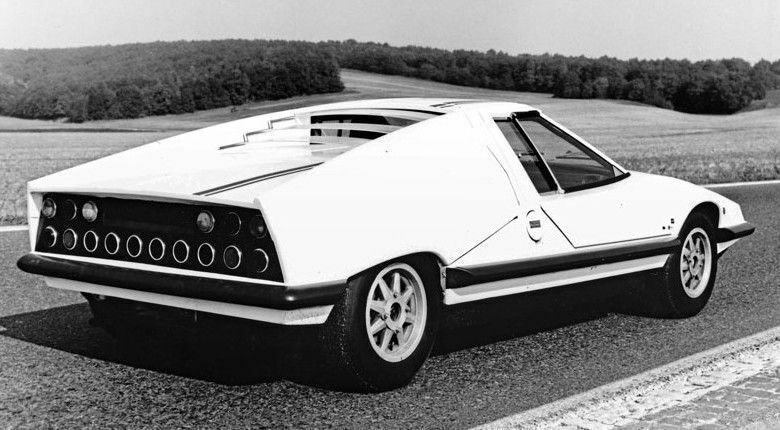 The bodywork solution was not an attractive solution in 1971, but when the unconventional coupe was made public, was undoubtedly interesting technically. Super Sport is based on the coupé's raised platform, which also needed an auxiliary frame to accommodate the engine, for rear suspension. 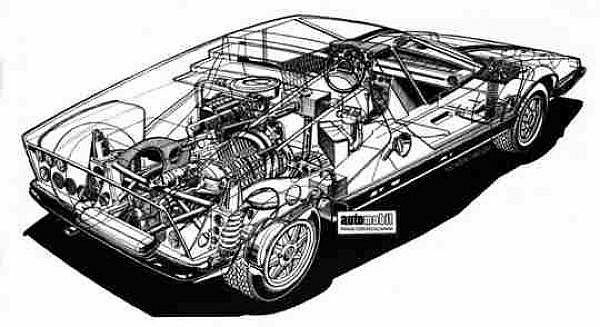 The mid-engine Škoda sports car is powered by 4-cylinder, OHV water cooling engine, which is just a 1107 cm3 engine, and this engine came from the Skoda 110 L Rally car – with A2 Weber twin carburetor, and its performance is 73 DIN hp (54 kW) at 6 250rpm, and its peak torque is 60 lb-ft (81 Nm) at 5250 rpm. 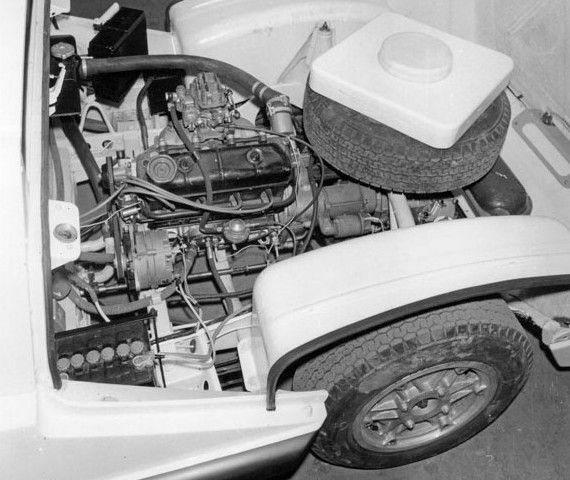 Whereas the Super Sport model has become a mid-engined sports car - thus, an auxiliary frame was needed to allow the engine to be installed in front of the rear axle, and the differential was turned 180°. The engine is equipped with a 4-speed gearbox (from Škoda 110). The front and rear suspension also come from the Škoda 110 L with coil springs and coaxial telescopic shock absorber, and take care of stopping with front brake disc and the rear brake drum two-circuit braking system, which already received a brake assist in 1971 (from Polish Fiat 125p model). The Škoda Super Sport got a very small wheel, in the 13-inch size and the wheels are fitted with Barum 175 SR13 tires, with OR6 pattern. In the 1970s, even the 13-inch wheel size was average, - today, however, Škoda Fabia or Toyota Yaris also has a minimum of 14 inch wheels (but the optional wheel range also offers these models a 17 or 18 inch wheels, from the factory option list). The self-supporting body received a huge arc on the raised platform, which has 2-2.5 mm thick fiberglass body elements with metal reinforcement. 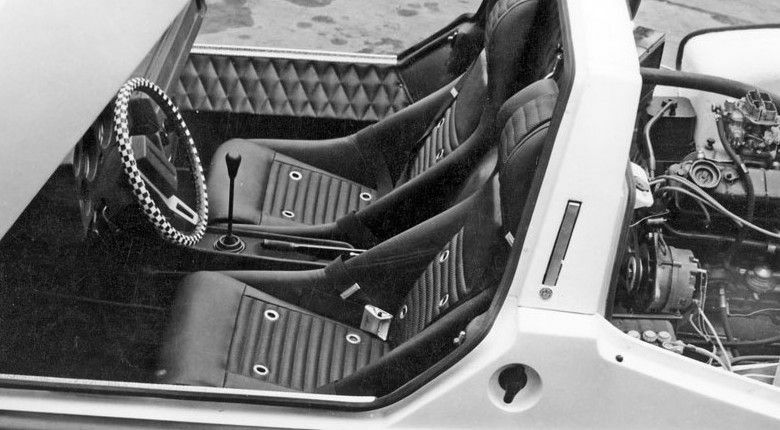 The Škoda Super Sport got a unique door instead of traditional doors, - thus, the upper part of the bodywork can be folded forward with the windshield and the roof, and racing cars ordinary side windows. The hood is the entire rear body shell, and beneath the petrol engine, and the battery is located to the left of the engine and on right side we find the oil cooler, and this Škoda model has got an electric fan - and got a 70 liter fuel tank behind the seats. The 110 Super Sport outer appearance has got a thick rubber protective element, on the front and rear bumper, and on the side. The original prototype got a hidden lights row, which contained six round lamps (two dipped beam headlights, two main beam headlights and two fog lights). Škoda 110 Super Sport’s external dimensions are as follows: wheelbase 2 500 mm, front and rear track size 1 310 & 1 300 mm, however length 4 060 mm, width 1 640 mm and height 1 120 mm. According to the factory measurements the dry weight, just 898 kg, and weight distribution 46.2:53.8 % between front and rear axles. The maximum total weight of two persons and a package of 50 kg, so already weigh 1 087 kg, with which the weight distribution ratio changes, 50.8:49.2 % (between front & rear axels). The drive is powered by a 1 107 cm3 engine with 73 hp (54 kW), and its top speed is 180 km/h (111.8 mph), and 0-100 km/h (0-62 mph) acceleration for 15.3 seconds, which has a predatory appearance (and fair aerodynamics) was not just for dazzling values. 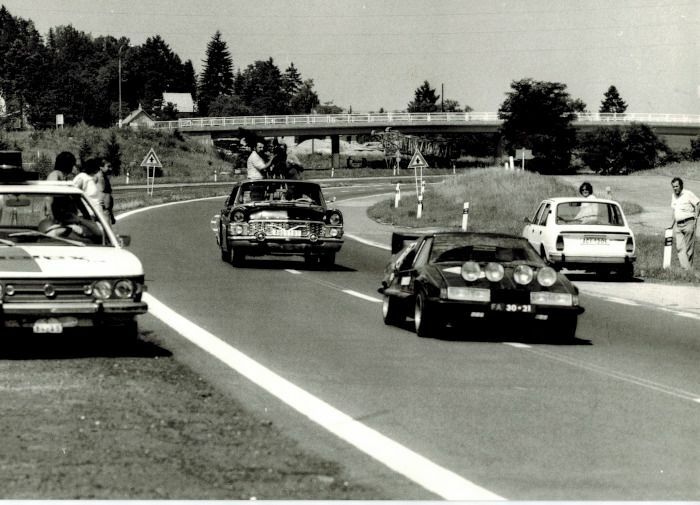 The car's behavior was tested at a higher speed, and for the duration of the test, a temporary engine was given to the sports car, which was already a 1 147 cm3 engine with 104 hp (76.5 kW). In addition to the stronger engine, the new Dunlop Racing tires were also offered by the Škoda 110 Super Sport, and with these modifications, the top speed reached 211.5 km/h (131.5 mph), but with the original Barum OR6 tires only the top speed of 207 km/h (128.6 mph), combined with a stronger engine. The factory tests were held between May and November 1971, after which a 110 Super Sport was running a small career, at the then car exhibitions, which included the Mladá Boleslav Motor Show. In 1981, the coupe was modified by the AZNP Development Department, according to Theodora Pištěka artist’s suggestion, after which the second life of the Super Sport model began. The car was starred in the Czechoslovak movie „Upír z Feratu” (Ferat Vampire), which gave the prototype a new opportunity. The film was made by arranging Juraje Herze, in which the SuperSport model is driven by Mima (Dagmar Veškrnová), and passenger Kříže (Petr Čepek). 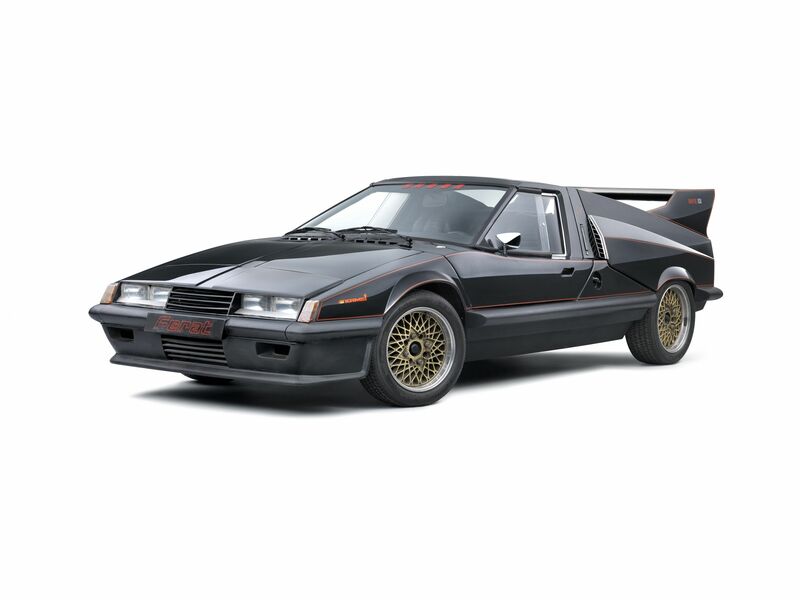 The Škoda Super Sport appears in the black horror form, in the movie called „Ferat“, and the movie version of the car can be found in the Škoda Museum, Mladá Boleslav.